I adore financiers! They're not particularly common here, but seem to be a standard pâtisserie item in France, and are very popular in the French bakeries of Japan. 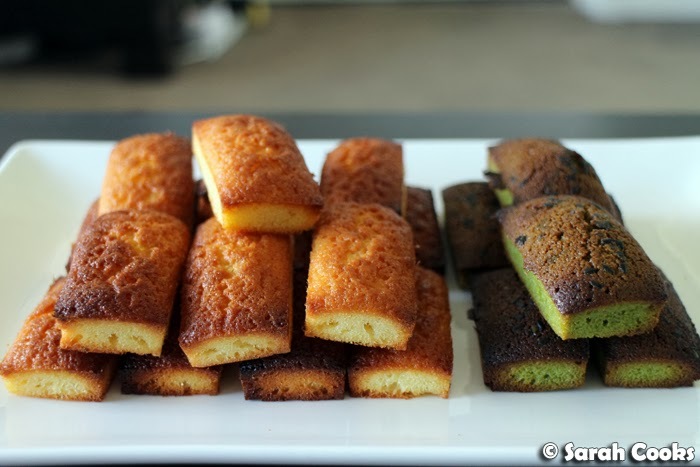 Essentially, they're little almond cakes, baked in an oblong shape, rather like a gold bar - hence the name "financier". (And now that I think of it, they'd probably be a good thing to bake around Chinese New Year!) They're similar to friands, but don't even think of them as in the same league as those dense, dry, mass-produced oval cakes that we get at chain cafes in Melbourne. These are moist, tender little cakelets, fragrant with almond meal and with the slightest crunch on the corners. Gorgeous. I baked these one weekend morning, when I had a bowl of frangipane in the fridge, leftover from an apple tart I'd made the night before. (I'd been a bit enthusiastic with the quantities!) So the next morning, I just baked the frangipane in the financier tin and - bang - financiers for breakfast. 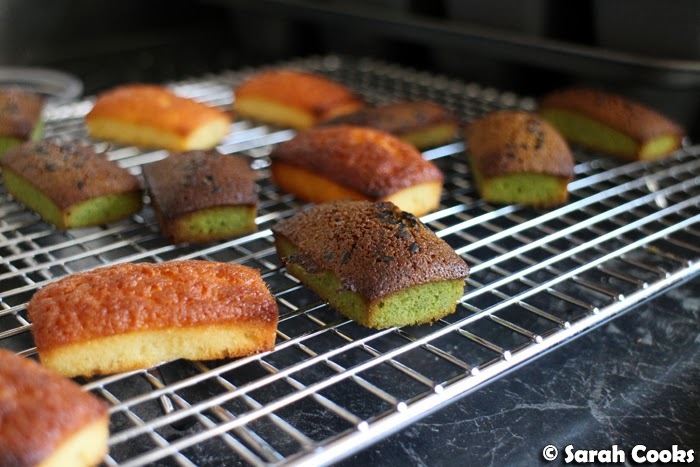 I decided to make some plain financiers, and some matcha flavoured ones too. I was recently sent a sample of high-grade Kenko brand matcha powder, and have been looking for an excuse to bake with it. As you can see in the top photo, it makes an intensely green, green tea. However, despite its colour, it isn't bitter or acrid - it just has a pure matcha flavour. (I also think this is partly due to the fact that I've recently learned to use water heated to 70C when brewing green tea, to prevent it going bitter - so even if you're not using fancy expensive matcha powder that's ground to order in small batches, it's worth using a kettle with a temperature control, or just adding a little cold water to your cup before adding your green tea!) I have a couple of other baking plans for the matcha powder, so watch this space. David Lebovitz has a recipe for green tea financiers in Ready for Dessert, which is where I got the idea to make these, but his recipe is altogether more fancy, instructing you to grind your own almonds. 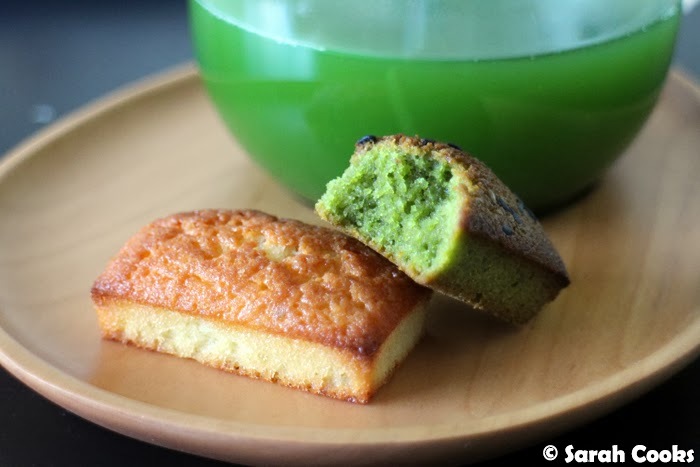 I just added some matcha powder to my frangipane mix, and used his idea of sprinkling the financiers with a mix of black sesame seeds and salt. And ta-dah! Cute little golden (and green) bars! As I mentioned above, I was so impressed with the Silikomart financier tray - it didn't require any greasing, and the little financiers popped out very easily, with perfectly clear and defined corners and edges. I thought these were a great light weekend breakfast, but I think they're even better as an afternoon tea treat, with a cup of tea or coffee. Whisk the eggs and sugar together until the sugar is dissolved. Gently whisk in the almond meal, followed by the melted butter and vanilla extract. Spoon or pipe the batter into the indentations of a financier tray. (Alternatively a mini muffin tin can be used). A silicon tray will not need greasing, but if you are using a metal tray, I would suggest greasing the tin with a little melted butter. Bake for 5 minutes at 220C, then turn the oven down to 200C and bake for a further 8-12 minutes, or until cooked through. 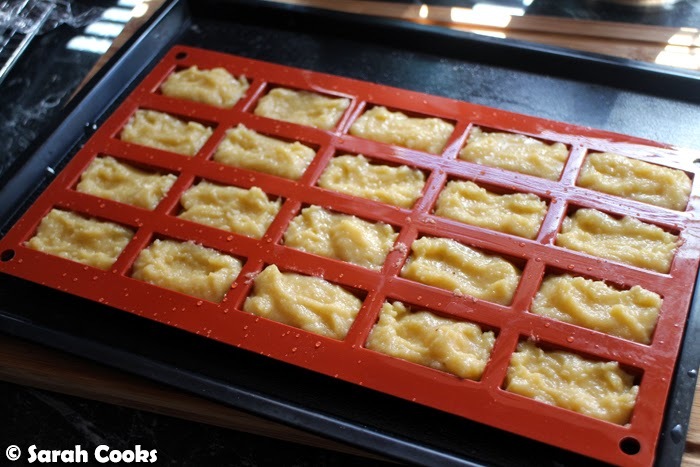 Allow to cool slightly before unmoulding onto a cake rack to cool completely. Makes approx. 24, depending on the size of your tin. 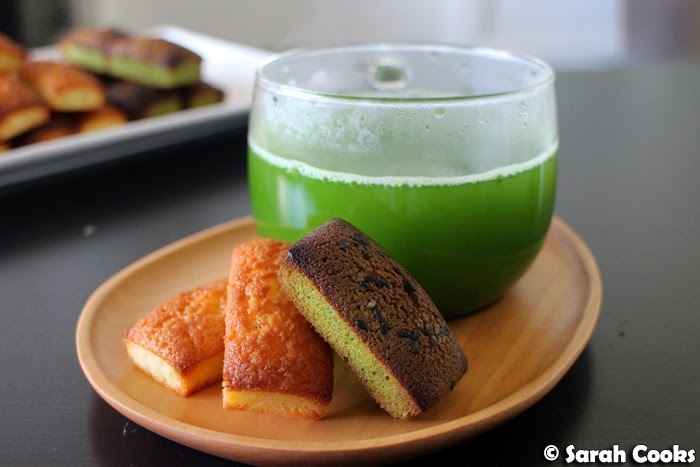 For matcha financiers, omit the vanilla extract, and add 1 teaspoon matcha powder to the batter. 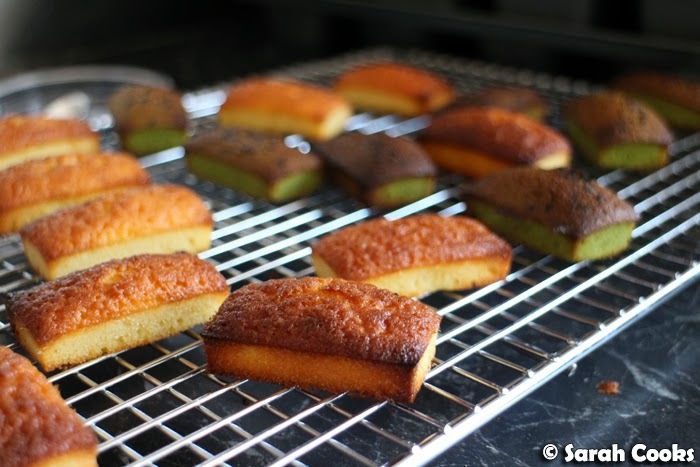 Before baking, sprinkle the financiers with a mixture of black sesame seeds and fleur de sel. Oh Sarah. Peanut butter brownies and now these? Next you just need to make Mont Blanc and something with black sesame and it'll be hard for me not to fly straight home. What the... I missed this post!!! 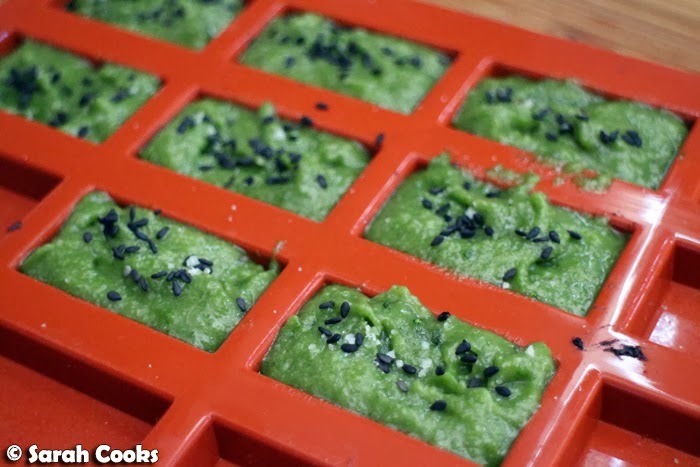 These look amazing and you know how much I love MATCHA :D Can't wait to try!